A rare account of one white woman’s journey to understanding some of the issues that perpetuate racism in America. Deborah Howard’s unique perspective provides critical insight into racism’s complexities — a MUST read. CEO The Kaleel Jamison Consulting Group, Inc., co-author of The Inclusion Breakthrough and managing editor of The Promise of Diversity specializing in fostering an inclusion mindset for higher operational performance. If you are interested in buying the book in bulk for your classroom, book club, or support group, or in having Deborah do a talk, book-signing or workshop,please click here. Sign up for a free consultation session now! A Metaphor for Healing and Reparation. 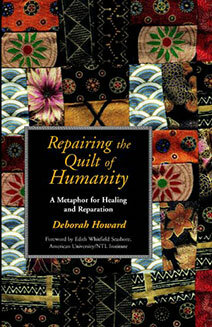 In her book, The Quilt of Humanity: A Metaphor for Healing and Reparation, Deborah uses the metaphor of a quilt and, drawing on her own cultural background, employs the Jewish concept of tikkun olam—healing and repairing the world—to present a provocatively insightful way to look at the impact of racism, and other forms of injustice, on individuals, groups and society. Just as individuals and groups are injured and torn as a result of injustice, so too, is all of humanity. Deborah weaves her own story of injustice into the larger pattern to illustrate how all of us are part of the quilt of humanity and how reparation and healing is required for bringing about equity and justice. If you are interested in buying the book in bulk for your classroom, book club, or support group, or in having Deborah do a talk, book-signing, or workshop, please click here.